The Hardly Strictly Bluegrass Festivalin Golden Gate Park is one of the greatest events I’ve ever experienced. 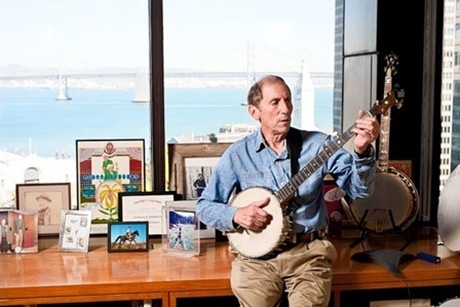 It’s remarkable for so many reasons, chiefly in that it was and remains free to the public, a gift to the city of San Francisco and the nation by financier and philanthropist Warren Hellman, who died Sunday at age 77. All I ever heard about Hellman was that he was an unusual guy and a mensch to folk and bluegrass musicians. The artists and sidemen I know who’ve played HSB often say it’s their favorite festival of the year, because of the lineup, the setting and the respect Hellman paid the musicians at all levels. “There was just something about Warren Hellman, beyond his being staggeringly rich, but I didn’t know what that was until I read this marvelous obituary and appreciation in The Bay Citizen. Hellman’s life was just amazing. You should read the details. But what blows my mind, is that in these times of 1%ism and cultural strife, it takes an “eccentric” billionaire from San Francisco to highlight a puzzling and unfortunate thing: American wealth (about which I’m basically ambivalent) isn’t trickling down to American roots music and the whole Americana scene. This estrangement doesn’t speak well of Hellman’s class, because I think there’s a case to be made that whither goeth a nation’s music, there goeth the nation. And while some view Americana as just another musical format/genre/category, the more appropriate way to see it is good cells in our cultural bloodstream. Bluegrass and folk music was a great 20th century profusion of humanity and freedom that could keep us sane and connected in the chaotic 21st, if we can stay connected with it. American roots music’s fine art pinnacle is jazz, which has issues and struggles of its own, and American roots music has many branches. But let’s call what Hellman cherished and supported bluegrass, hardly strictly speaking, and let’s agree that bluegrass is NOT flush with resources from our country’s patrons of arts and culture. Because modern America has insisted that bluegrass compete in the free market pretty much like hamburgers or cat food, our music is experiencing all the strains of the rest of the record business, which has been smashed to pieces by technology and widespread ignorance and heedlessness about intellectual property. And in a country of 300 million there should be room for that. But only a small handful actually achieve full independent professional status and longevity. I know these people and it’s one thing to scrape by as a kid sleeping five to a hotel room as you pay your dues, but it gets pretty hairy for those over 35, even for many “legends” in the current marketplace. From a patronage point of view, there are a few companies around the country that back roots music through festival sponsorships. But there’s nothing else out there like what Hellman built – a giant stage for American music to be shared with Americans. This vital part of American culture has proven its worth as an art form and an ennobling fountain of social cohesion and learning. Folk music, broadly defined, has surged and ebbed in popularity for decades, and it’s surging these days, even as its hampered by the puny revenue streams that flow to all but the top few artists. This is a moment that could be seized on by the most fortunate to truly help their country’s mental and spiritual health. I suppose it’s a victory that one hears fewer people patronize bluegrass than years ago, but where’s the patronage? I work with the key business associations trying to help the free enterprise side of bluegrass/roots, so I’ve had my ear to the ground about this stuff, and mostly what I see are good organizations constantly struggling to keep the books balanced. The guy who claimed to have acquired Bill Monroe’s mandolin for the Country Music Hall of Fame for a million bucks turned out to be a fraud. And that was never going to help families see, hear and experience Americana music anyway. I love an iconoclast and different thinkers, and it’s clear that Hellman was such a figure in the financial sector, where more of his ilk are needed. He was a great man who is now being remembered for great things, but he’s also a symbol of a sad schism. The reason people are in the streets as 99 Percenters is not, as some would tell you, a movement to smash capitalism and foment a Marxist revolution. I literally know zero liberals who think like that. It’s a protest against the furious heedlessness to our cultural togetherness that the banking, financial and corporate class have demonstrated during the past two or three decades. We can debate marginal tax rates elsewhere. I’m talking about large-scale philanthropy and its blindness to an art form developed by the American middle and working class. Hellman GOT it, as we say. But he was an exception to prove a rule. He – and Steve Martin – ought to inspire some of the others sitting on 40 to 50 percent of the nation’s wealth to think about the bluegrass culture – its festivals and presenters and musicians and institutions – as part and parcel of our American life and a worthy place for giving. Hellman’s independent spirit and big-hearted love of bluegrass has searing political overtones as well (the note about Hellman leaving the Republican party in 2008 should not be overlooked). I’m trying to get something on that together for the next day or two. In the meantime, who am I missing in the Bluegrass Philanthropy Hall of Fame? Who should get credit? Please share what you know.